UPDATED 7:55 A.M. ET (DEC. 23, U.S.A.) In May 2009, before the launch of the alleged Zeek Rewards Ponzi scheme, a Zeek promoter who has hired famed attorney Ira Lee Sorkin appeared in a check-waving video for an “opportunity” known as Regenesis 2X2. Check-waving is used as a form of “proof” that an “opportunity” that “pays” is not a scam. She’d been in Regenesis 2X2 only since May 1, and already had received a nice payout, Gilmond explained. “Knew this company would work,” she said, before alluding to a Biblical tale of an apostle who insisted on proof of the resurrection of Jesus. “A lot of people are nonbelievers, doubting Thomases, didn’t believe it,” Gilmond said. 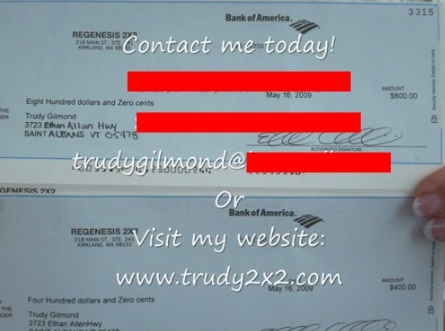 She then presented checks as a form of proof that Regenesis 2X2 paid. Agents, according to court filings, observed complaint letters directed at the firm being discarded into a Dumpster that was kept under constant surveillance. Also found in the Dumpster were copies of checks sent in by customers, other documents that included customers’ names and information to identify them personally, complaint faxes sent by customers and a letter from a law firm complaining about false, misleading and deceptive advertising. In one case in which agents were observing one of the adult principals in the case, they observed a youth described as a teenager exiting a vehicle and “struggling with a large arm full of opened business and UPS Priority Mail envelopes,” the Secret Service said in court filings. The juvenile entered a building and “then immediately came back outside and discarded the materials into an alley [D]umpster,” agents said. Agents identified the adult under surveillance as a person “arrested by the Internal Revenue Service out of Las Vegas, Nevada[,] for felony violations related to Illegal Money Laundering from Securities Fraud and Wire Fraud” in a previous case. How the Regenesis 2X2 probe proceeded is unclear. What is clear is that Zeek eventually came to the fore. In court filings, Sorkin has noted that Gilmond has potential clawback exposure of more than $1.364 million from the court-appointed receiver in the Zeek Rewards Ponzi scheme case. Gilmond once was listed on a Zeek website as both an “Employee” and “Official Rep.” So, too, was Zeek pitchman OH Brown of USHBB Inc., which produced ads for both Zeek and the collapsed Narc That Car pyramid scheme. For a while, at least, Zeek and Narc That Car appear to have used the same North Carolina-based bank: NewBridge. Checks displaying the name of NewBridge showed up in independent affiliate promotions on YouTube in 2010. After one Narc affiliate quit the program, he moved to another one. The check-waving for the new “program” began at the one-second mark. Literally. A source told the PP Blog last week that Zeek figure Robert Craddock now was pitching Offer Hubb. Craddock is a purported Zeek “consultant” raising money to contest elements of the SEC’s Ponzi-scheme complaint and the court-appointed receivership. In July, Craddock sought to have the website of Zeek critic K. Chang removed from the Internet. Craddock was successful briefly, but the “K. Chang” Hub at HubPages returned. For years, questions have been raised about whether fraud schemes within the MLM sphere were recycling money between and among schemes and putting banks and other financial-service companies in possession of tainted funds. Purported “Wiring Instructions” of Offer Hubb imply that the Wyoming-based entity is soliciting sums of up to $10,099 from prospects and is using City National Bank. As mentioned in the introduction of this review, “1712 Pioneer Avenue” is the headquarters of “Corporations Today”. The address is apparently so well-known in tax haven circles that Reuters used the 1712 Pioneer Avenue building itself for a 2011 article on corporate secrecy in the United States. When will these guys be stopped?? I assume it will be a matter of time before the hammer comes down and we can paint a better picture for MLM. Quick note: You’ll notice in the screen shot above a URL styled Trudy2x2.com. Web records suggest that URL, originally used to promote Regenesis 2X2, later was used to promote Zeek. And Trudy2X2.com now appears to be redirecting to “World Consumer Alliance,” a site we previously reported was advertising one HYIP scam after another. After that, a report surfaced on BehindMLM that “excited” folks who attended a WCA event in Florida were fainting. Another site registered to Trudy Gilmond is “JOINTRUDY.BIZ”. This site is promoting an ex-Zeek favourite GoFunRewards/GoFunPlaces. Interestingly, another domain of hers is “jointfu.info”, which goes to the same place, but with a different referral ID. Trudy has also promoted something called “freewaytosuccess”. I didn’t bother looking, I guess it’s the usual MLM/HYIP/Ponzi/pyramid scheme drivel. I have been a member of for about a month. My sponsor Aaron and Shara are friends with the owner Paul Burks and have tested it for over a year now. It is backed by a 13 year old debt free US based company located in Lexington, North Carolina. I really, really hope that they are on the subpoena list. I have seen scammers all over the net boasting how they were ‘winners’ in Zeek. maybe they won’t be so happy when the reciever comes calling for their clawback.